Best 15 Creative Spring DIY Ideas including Spring decor with their hands: 15 master classes – butterflies, birds, branches and flowers. Spring is the best time to get a change, a new interior and decor, even in small things.And you’ve already gotten her inspiring mood? To call on the allies Spring, invite her to his house. For example, the miraculous springdecor, made with his own hands. Meet our fresh ideas! This 15 master classes in the format of quick guides (picture + what + will do). And the theme of the décor-only spring: butterflies, birds, branches and flowers, from 3 to 6ideas for each inspiring (and trendy) themes. Be inspired and be creative, self-confident and Beloved home! Light butterfly wings quivering in the wind … Yet the weather, so they flew, but why not make a winged beauties with their hands? 1. lamp shades and candle holders. For example, here’s the Butterfly — in all its beauty and diversity. They will, as expected, to flap its wings each blowing in the wind. Material: thick paper with pictures of butterflies (take a page from the textbookbiology or print yourself), lamp or glass candlestick. And this is the option for sophisticated aesthetics. Amazing butterflies seem to fly on one of the walls. Materials: cover or wrapping paper to the effect of “ombre” (gradient Weirs) andPlexiglas. Cut paper stencil of two to three dozen butterflies — large and small, thanks to theperelivam of colors on paper they would look a little different. And then reassemblethem in “Stayki” and stick to the glass. To secure the panels to the wall, drill the holes in the corners, and then thread thefishing line and hang on a nail. Or attach to the wall by means of screws. Admirespectacular! 3. The Accentual wall of wallpaper with butterflies. Winged beauties just settle on the wall — and enjoy them while waiting for the present. Materials: wallpaper with butterflies, subtle moldings, paint in the color of the walls.And, of course, is part of the wall, on which they will “flit“. Cut a piece of wallpaper, stick it on the wall, from ceiling to baseboards. Framemolding from two sides, molding paint in the color of the walls. Of the remaining wallcut out butterflies and let them circling to the right or left of the accent of the plot. In early spring the birds still sing, but had already returned from warmer countries. If you live in a metropolis and feathered meet infrequently, get inspired by the fashionscene with the spring mood. 4. Birds-pendants from salt dough. Do you love bouquets of tulips or other bright colors? Settle around flowers and sprigs of colorful birds – and the composition will be even more charming.Materials: salt dough, as well as paint and a stencil.Prepare the dough and roll it (all described in detail in a master class №12 – «flower clock”). And then attach the stencil and cut the birds on it.With a toothpick, do the holes (to be able to hang), leave to dry. When the dough is dry, anneal it in an oven (80 ° C, about 2 hours), then colorize. Then insert the line and attach the birds to the branches. 5. Spring decor of birdhouses. Nature awakens and render habitable bird nesting boxes, make their nests, chirp fun. What could be better? Even if you can not hang the birdhouse in the garden, you can still enjoy the company of birds. Bonus: decorative birds do not scatter feathers.Materials: several decorative birdhouses, paint-spray different colors and stickers with birds.Cover painted birdhouses, each of the same color. Attach them to the wall (mounting depends on the type and thickness of your walls) and settled around birds with stickers. And wait for the garden will sing their cousins! 6. “bird feathers” – decor vases. Flowers is a great decoration but also vases can complement their beauty. Painted vases are more expensive, but you can do it from the ordinary porcelain vases. For example, adorning this true story–spring bird plumule. Materials: Bowl, matte labels (buy them or order in the printing industry) and original idea. The most complex here is to choose a plot that will decorate the vase (in this case,feathers). Well, more business for small–glue, put the flowers and enjoy. Vase is better to take a contrasting (for example, if the flowers are yellow, vase can beblue or dark blue). As for the color of labels: white suit to a vase of any color exceptwhite. And here’s the color the best look on any background. Admire the flowering branches can be infinite – it is one of the most exciting moments of spring. Prior to flowering season is still far, but you are quite capable to grow miracle tree at home. And best of all – not fragile flowers Will fly under the pressure of the wind. 7. Branch of Sakura on the chest. You can enjoy this wonderful volume composition every day, and if you want to easilychange the decor. Materials: large sticker for walls in the form of flowering branches and chest of drawers. Remove the tape, attach the sticker on the boxes. Then use the cutting torch cut the extra twigs and glue them to the wall, as shown in the photo (or as you wish). Do not forget to cut the sticker and in places where it gets between the drawers — otherwiseit would be difficult to reopen them. Isn’t it adorable? 8. Silk twigs in a vase. Here is another way to make a flowering twigs. They will please your eyes for as longas you need, and not Jones ahead of time. And they are very easy to make. Materials: aluminum wire thickness 2 mm, silk paper in different colors (can be foundin the shop of needlework), glue. Cut a piece of wire to the desired length. 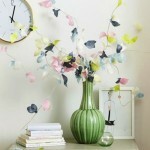 Cut paper petals with stebel′kami, glue them to the wire. And then add a branch to the desired shape. 9. Flowering tree on the wall. In your garden until nothing blooms? So, it’s time to grow your own tree, which will delight the lovely flowers all year round. Materials: wall or other extensive surface (in-house or outside, but make sure that theplace is protected from moisture), paint (white is for the background, Brown–for-trees),pink wrapping paper. Prepare the surface by it in white. When the paint dries, draw the barrel. You can get acaricature image, but if you want draw the bark and mote. Then cut the flowers out oftissue paper, and once the paint is dry, glue them on twigs. If necessary, cover withwaterproof varnish. This tender sapling will love the children and romantic figures. Unlike butterflies, birds and flowering branches, enchanting spring flowers we can admire early in March. If floral motifs for you is not only fashionable, but also a favorite topic, now is the time to think about how to add it to the original Interior. This is a 6 master classes on the topic. Admire the old grandma’s cupboard flick of the wrist turns in knick-knack in a country style. And it is very simple. Materials: old cupboard with glass doors, beautiful wallpaper with flowers, double sided tape. Remove the back wall of the Cabinet and cut a piece of wallpaper to fit the front part.Then glue desktop bilateral adhesive tape (glue on the back side), insert the wall into place — and enjoy a charming Cabinet for kitchen, living room or Office. Simple and tasteful! Lilac – another herald spring. Want to sit in the shade of fragrant bush, but the weather did not have? Make your own “blooming” chair.Materials: paper napkins with a lilac, PVA glue, lacquer furniture and simple white chair.Cut lilacs, attach it to the seat of the chair. Glue and secure furniture varnish. To be safe, it is recommended to use a special glue for decoupage. And when guests come, certainly invite them to sit on this unusual chair. To make your own creative clocks don’t have to be a master watchmaker. For makingthese wonderful hours you don’t need special skills and materials — only that you probably have in your home. Plus a little imagination. Materials: salt dough (1 cup of salt, 2 cups flour, 1 cup of water), Skalka, oval dish, lacedoily (you can find at a flea market) and clock mechanism. Prepare the dough, roll it in a layer thickness of 1 cm. Using food cut-out dough circle.Fold the napkin in half, place it and press down to the root of it-based figure. Remove any excess dough and cut out the hole for the arrows in the middle (use a straw for cocktail). Then completely dry hours (must not be wet spots; it may take a few days), thenfurther dry in an oven at 80° c (it is recommended that you keep a few hours). Left tojoin the movement, hang on the wall (use suspension for pictures), and watches with flowers ready! Create picture–the lot of talented artists, think you … And here and there! You are quite capable of making their own (copyrighted!) spring leaf — and all without a single brush stroke. Materials: white paint–spray, coloured paper, canvas and clay. Cover the canvas with paint from spray, let dry. Cut the florets from the colored paper:Orange, pink and white, similar to petals of flowering trees, do not forget to make awhite inner parts. And then spread the canvas Klee and scatter flowers as tells a fantasy. Here’s to you and a private picture, co-written with the wind. Compact and cute, “blooming” hanger hallway or bedroom will bring spring mood and make the boring everyday life a little more pleasant.Materials: board (the author uses 170 x 68, but you can do more or less or take the old door leaf), white, flowered wallpaper, roller paint, wallpaper glue, screws and drill.Paint the white board. When dry, cut a piece of wallpaper on the size of the canvas. Spread the wallpaper glue and allow to soak (10 minutes). Then glue the wallpaper, when dry – fasten hooks for clothes. And homely new hanger – beautiful and practical. Love romantic style, but has not yet found a suitable decoration for walls bedroom or living room? Do it yourself – and get a perfect decoration in full accordance with your taste.Materials: 3 pieces of wallpaper (with the same pattern but different colors for spring decor better suited pastel colors), 3 identical piece of chipboard (or plywood) of the desired size for the base, holders for pictures.Wallpaper paste over the base, taking the edge (as wallpaper should be wrapping the panel, like wrapping paper or canvas. Attach brackets to hang paintings and a short distance (3.5 cm apart). Romantic floral triptych, worthy of an art gallery is ready! In concluding this collection of master classes, we want to remind you that all ideas are easy to implement with their own hands. And thanks to the speed and maximize savings, you have a chance to get the actual spring decor already on next weekend.Have a great result and a lot of pleasant surprises that will give this Spring! Related Post "Best 15 Creative Spring DIY Ideas"